© 2008 TAASI Corporation. 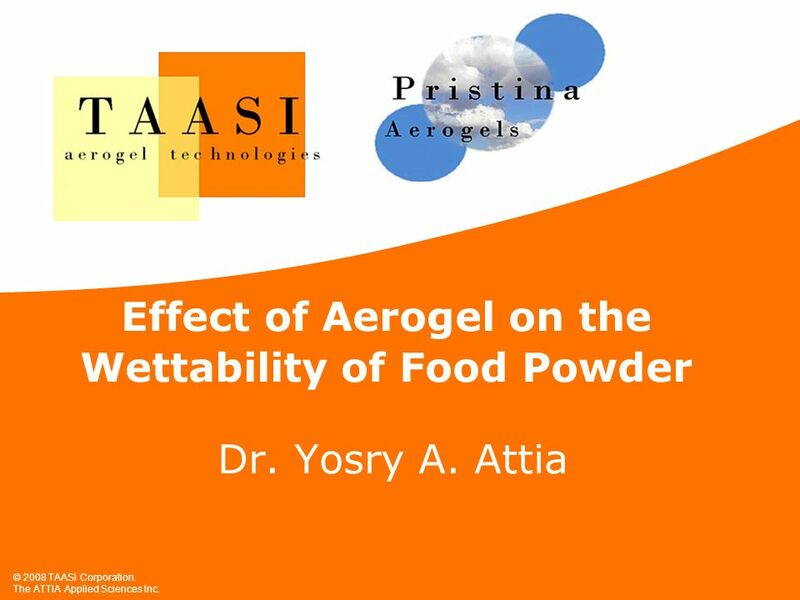 The ATTIA Applied Sciences Inc. Effect of Aerogel on the Wettability of Food Powder Dr. Yosry A. Attia. 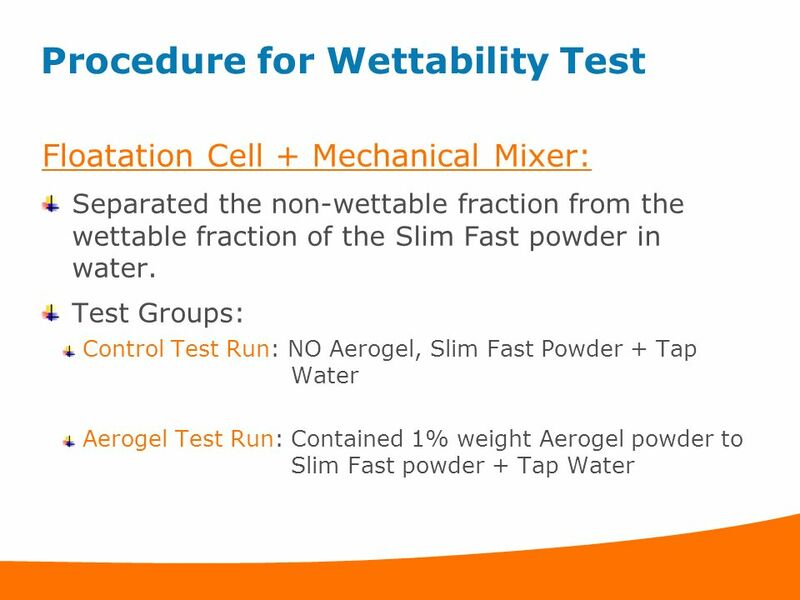 2 Wettability Test Objective Aerogels will be used in a test to increase the wettability of food powder products such as Slim Fast in order to improve processing cost. 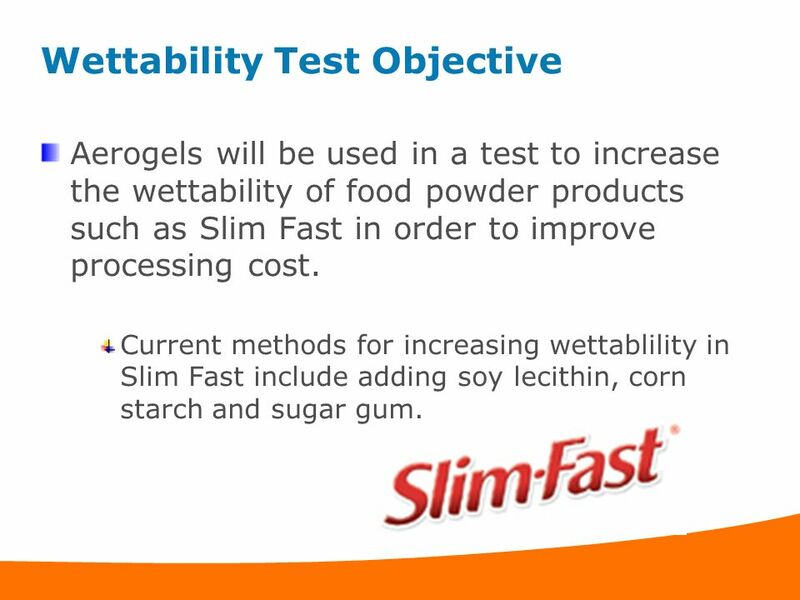 Current methods for increasing wettablility in Slim Fast include adding soy lecithin, corn starch and sugar gum. Download ppt "© 2008 TAASI Corporation. 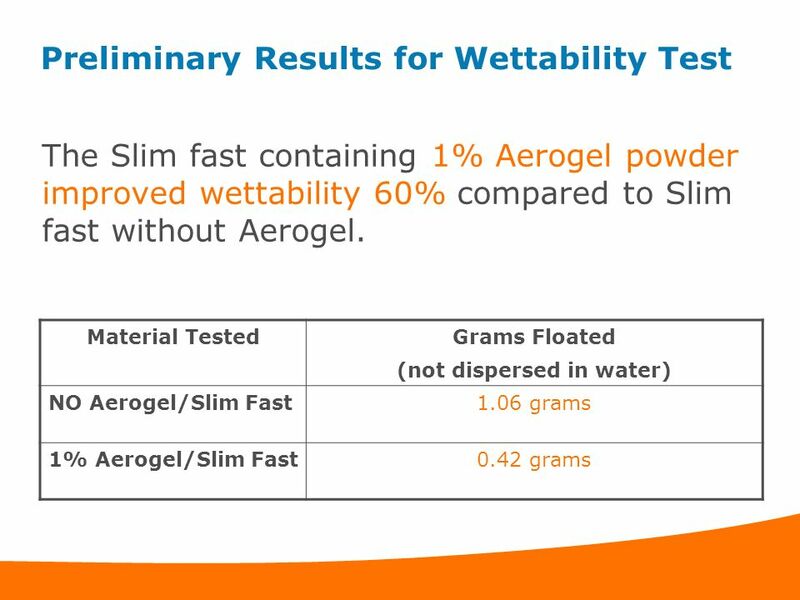 The ATTIA Applied Sciences Inc. Effect of Aerogel on the Wettability of Food Powder Dr. Yosry A. Attia." Food Safety Research Programming in Estonia Hendrik Kuusk Food and Veterinary Department Ministry of Agriculture. Mixing Things A Science 21 Reader Written by Dr. Helen Pashley Photographs by Lori Adams For Putnam/Northern Westchester BOCES ©2008. LET’S PLAY JEOPARDY!! Carbo’sFatsProteinVit. &Min. Water Q $100 Q $200 Q $300 Q $400 Q $500 Q $100 Q $200 Q $300 Q $400 Q $500 Final JeopardyJeopardy. WHO??? Carbo Cal 4. This is Carbo Cal 4 His name will help you to remember that there are 4 calories for every gram of carbohydrates you consume. SCIENTIFIC SERVICES S/D INC October 2004 ASTM D 3556 RESEARCH Deposition on Glassware During Mechanical Dishwashing Background1 Preliminary Soil Exp. 3-5. Emulsions Noadswood Science, Emulsions  To know what emulsions are and how they are useful Friday, May 15, 2015. Tofutti’s New Items. Yours Truly A healthy scoop of creamy vanilla Tofutti inside a chocolate coated crispy cone, then covered in deep, rich chocolate. COS- 2a Define mass, volume, and density. Question What will happen to the coke and diet coke if we place them water? Question What will happen to the. 1 By: Julia And Keely. Sorbitol/Glucitol Gum Base Xylitol Natural Artificial flavoring Mannitol Glycerin BHT Blue 1 Red 40 Soy lecithin Yellow 5 Yellow. Tofutti Cuties About the Tofutti Cuties Tofutti Cuties®, the Company’s best selling product, are the bite size frozen sandwiches combining. Healthy Breakfast As the first meal of the day, it gets the body going and ready for the rest of the day. Study after study shows that teens who eat breakfast. Nutrients and Non-nutrients Nutrients : CHO, Fat, Protein, vitamins, minerals, and water, they have certain functions in the body and they are essential. Experiment No.4: Grain size analysis Part II: Hydrometer analysis. Solutions Solution: Homogeneous mixture, a mixture in which the components are uniformly intermingled. Solvent: Substance present in the largest amount. Tommy Miu Jen Shido Jaymee Wakumoto FSHN 381 Department of Human Nutrition, Food, and Animal Sciences University of Hawaii.